Note how carefully the two titles are chosen: Becoming A Writer is for people who want to write and need some hints about getting started. 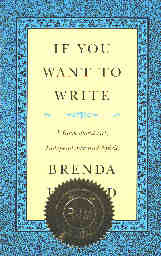 If You Want To Write is for people who want to become writers and need some hints on how to channel their desire to write in productive ways. Both of these writers understand how the unconscious can be tapped by the conscious mind. One cannot find material in either of their books that dated them (except the reference to reducing a meat budget for a household for a year by $3.70). Their psychological insights are as pertinent today as any NLP Master Track graduate might conjure up. One of the major insights for me was that following the process for a long period of time was a prerequisite for judging whether the process worked. There is no other way. Since I had been free-writing for a year before reading these two books, I was in a position to attest to the efficacy of the suggested exercises from personal experience.